Normally I gravitate towards low, lush arrangements and skip towering columns of flowers–but I'll make an exception for this dreamy combination of prep and polish! 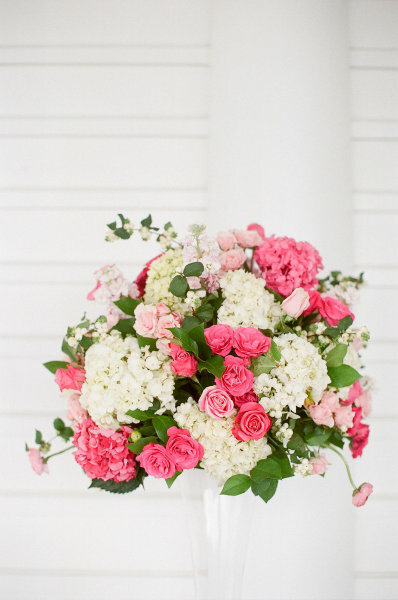 Hydrangeas, roses, ranunculus–it's an over-the-top look with understated flowers that's the best of both worlds! What's your preference–table-skimming arrangements that encourage intimate conversation, tall bouquets with plenty of drama, or a combination of both? Image by Laura Ivanova Photography, arrangement by Sayles Livingston Flowers. I agree - I usually also prefer lower arrangements, but love this one (those colours!) and the white vase. So pretty! Love the pinks! I favor low arrangements but I can't help but admire high arrangements that are so pretty like this one! Im a table skimming gal. I like to be able to see over the arrangement so I can talk to people. I'm totally with you, there's something to be said for that gorgeous bouquet. We did little vintage brass cups of all varying heights and added simply arrangements. Everyone could see across the table and the table still looked full.